Legalfutures report today on the Bar Council getting permission to plug a pensions gap through raised Practising Certificate fees. The story contains interesting data on Barrister’ earnings. It seems these must be gross earnings (I assume therefore the numbers do not include deductions for chambers and expenses and of course tax). The Bar Council’s original paper predicts what they think Barristers will be earning this year, and so I have taken the data and put it in a graph to illustrate the distribution. A second interesting point emerging from the LF story is that the £30-60k band contains a ‘significant minority’ who are from the employed Bar so in broad (and crude) terms, if we were imagining this as a distribution of the self-employed bar we might want to depress the second column a bit more than the others. A barristers’ clerk tells me that, “working on Chambers expenses of 15 to 25% plus travel, books, income replacement insurance etc,” one would take off 30 to 40% from gross earnings to calculate a crude figure, “to be safe”. Though that figure has been disputed. So using 30% as a cautious guide, [it looks like overheads will bite harder at the lower end]* the columns above would be 0-2ok, £20-40K, £40- 60k and so on. I have not taken much interest in Bar earnings, so it may be readers can point me towards better data. This suggests about half earning £6ok or more before tax (but query how taking out employed barristers would effect this). 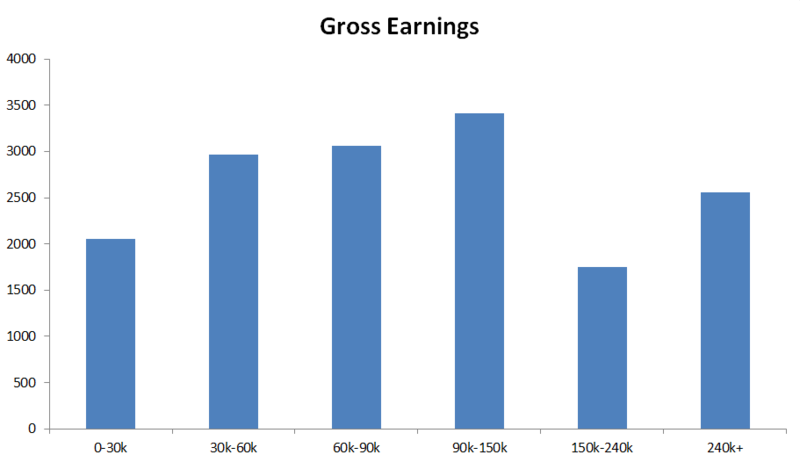 Given the risks posed in seeking to qualify and establish as a barrister, and assuming the varied earnings associated with certain types of work, these are interesting numbers; but law students tend to focus on the earnings of solicitors at the very visible and well-paid end of the profession when thinking of career trajectories, and that would be a mistake, partly because there is a harmful tendency to equate success with money and money with prestige.